Muskets of the Crown is a non-profit organization dedicated to accurately portraying the lives of 18th-century British Soldiers in North America. We portray three Scottish Regiments: The French and Indian War's 77th Regiment of Foot, the American War of Independence's 42nd Regiment of Foot, ​and the 84th Royal Highland Regiment of Foot. The Highlands of Scotland were a wild place in the 1700s, full of rebels, robbers, and warring clans. To keep the peace, King George I in 1725 ordered the formation of six independent companies of Highland troops to act as a local police force. These companies quickly earned the nickname "The Black Watch" because of their dark tartans and their job of keeping watch over the Highlands. They did their work so well that, in 1739 the King ordered them to be formed into a regiment to serve in the army. In this way the Black Watch became the first Highland Scottish regiment in the British Army and began a distinguished career that continues to this day. The regiment was originally numbered the 43rd and later renumbered the 42nd. It first came to North America during the French and Indian War and took part in the assault of Fort Ticonderoga in 1758, where it fought bravely in a costly defeat. Later, in 1758, it became a Royal Regiment by order of King George II. It was then known as the Royal Highland Regiment and its soldiers wore the dark blue royal facings on their red coats. After the severe losses at Ticonderoga, the 42nd did not have another major action until they were sent to relieve Fort Pitt in 1763 and help put down the rebellion of the Ottawa Chief, Pontiac. They spent the next few years on the frontier garrisoning small forts. They then left North America and were stationed in Ireland. The regiment returned to North America during the Revolutionary War. It fought in the British Army's campaigns of 1776 through 1778. It fought in the battle of Long Island, New York, the battle of Brandywine, Pennsylvania and the battle of Monmouth Courthouse in New Jersey. For the remainder of the war, it spent the time moving about New York and New Jersey. Finally it was sent to help relieve Cornwallis at Yorktown, Virginia, but was never landed and returned to New York in October of 1781. The regiment remained in New York until September or October 1783 when it went to Halifax, Nova Scotia. After both the French and Indian War and the Revolutionary War, many soldiers of the 42nd Regiment settled in North America. The records show that many were granted land in Canada. During the Revolutionary War, the Grenadier Company of the 42nd was often joined with grenadier companies from other regiments forming separate grenadier battalions. Women and children were included in the Royal Highland Regiment as official camp followers. The British Army allowed a few soldiers' wives to accompany their husbands overseas. The women were on half rations and the children we on one-third rations. As dependents of the army, they were subject to the rules and regulations of the army and to the orders of the regimental commander. In 1757, England was at war with France and battles were raging in Europe and North America. Needing more troops, King George II ordered a Scottish nobleman, Archibald Montgomery, the son of the Earl of Eglington to raise a regiment of highlanders. These clansmen from northern Scotland were renowned for their bravery and fighting spirit. Another highland regiment, " The Black Watch", was already earning a glorious reputation in the King's wars overseas. The newly formed regiment was embodied at Stirling Castle and numbered more than 1,300 men. The newly formed regiment set sail from Greenock, destined for Halifax, Nova Scotia. Although they had not acquired the skill in arms in a uniform manner they were ready to take part in a conflict later to be known as the French and Indian War. This war was known as the Seven Years War in Europe and battles were fought worldwide. As in all British regiments, there were the usual ten companies, but in the case of the 77th, three more companies were added. One of these thirteen companies was the Grenadier Company. The best of Montgomery's men were put in the Grenadier Company. Grenadiers were traditionally the biggest and strongest soldiers, whose job was to throw heavy iron grenades into enemy positions. Even when they stopped carrying grenades, the grenadiers retained their reputation as elite troops. Officially numbered the 77th Regiment of Foot, the new regiment was also referred to as the 1st Highland Battalion. It spent the next five years in arduous wilderness campaigning in the colonies of North America. In 1757, it was in the Carolinas with Amherst to help protect the settlers from Indian raids. Later the 77th was brought north to Philadelphia to participate in the Forbes campaign of 1758. It helped build a military road, complete with supporting forts, across the entire colony of Pennsylvania. The soldiers of the 77th took part in a surprise attack on Fort Duquesne, a key French post at the site of modern Pittsburgh. They also participated in the capture of Fort Ticonderoga on Lake Champlain in 1759. Montgomery's Highlanders battled Cherokee Indians in the Carolinas in 1760, fought in the Caribbean and took Havana from the Spanish in 1762. The regiment's last campaign was with Colonel Henry Bouquet, when it helped defeat the Ottawa Chief Pontiac's huge Indian forces in western Pennsylvania at Bushy Run. By the end of the war in 1763, Montgomery's Highlanders had marched four times across the length of Pennsylvania, building the road and many of the forts that grew into the cities and towns of today. They had fought in formal, European-style campaigns against French troops and in the wilderness engagements against some of the strongest Indian nations. After Britain's victory, the 77th was disbanded. All officers and men who chose to settle in America were permitted to do so. Each received a grant of land in proportion to his rank. The remainder returned to Scotland. Later, a number of these officers and men joined the King's standard in 1775. Women and children were included in Montgomery's Highlanders as camp followers. The British Army allowed a few soldiers' wives to accompany their husbands overseas, and often, other women attached themselves to the regiment when it stopped in one place for any length of time. Army women did laundry, cooking and sewing for the soldiers, as well as nursing the wounded. They drew rations and were considered women and children of the army. They therefore were subject to all rules and regulations of the army. Women and children were included in both Montgomery's Highlanders and the Royal Highland Regiment as camp followers. The British Army allowed a few soldiers' wives to accompany their husbands overseas by means of a lottery. Often, other women attached themselves to the regiment when it stopped in one place for any length of time. These women, however, were not on the official Army role so they would not receive anything from the Army as a means of support. Army women primarily took care of their own families but often took in money by sewing/mending, laundry services, cooking for officers or service in hospital. In exchange, the women received 1/2 rations while the children received 1/4 rations. 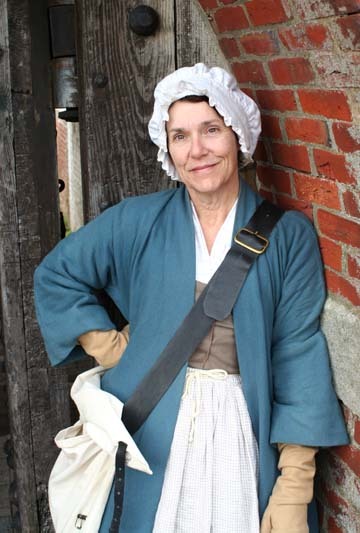 Most often, the women were placed in the rear with the baggage when in transit or left behind in a garrison or fort. Read more about being a member of the Muskets of the Crown Distaff on the Distaff Guidelines Page.